Steve Earle can pretty much cash in a good record without tying at this point. Not saying he isn’t trying on The Low Highway but it seems very effortless. He shape-shifts styles frequently trying on New Orleans swing on several songs, a banjo song and some accordion stomp. The slow acoustic opener, “The Low Highway,” sets the tone for the album then immediately goes into the grungy “Calico County” with some heavy guitar stomp. The record features accordion on “That All You Got?”, banjo on “William Hellman’s Banjo” then piano on “Pocket Full of Rain.” The record is elusive to pin down but that makes it a really interesting listen all the way through. The themes stay constant throughout the album while the approaches change. Making for an intriguing way to approach what can most broadly be defined as a record about America’s recession. “Burnin’ It Down” talks of burning a Walmart down, which is a relateable thought for more people than care to admit it. The slow, brooding song is a highlight along with the very up-tempo “That All You Got?” along with mid-tempo goodies “After Mardi Gras” and “21st Century Blues.” While this album may not possess Earle’s next “Copperhead Road” it is still another solid chapter in his career and fans will almost certainly approve. 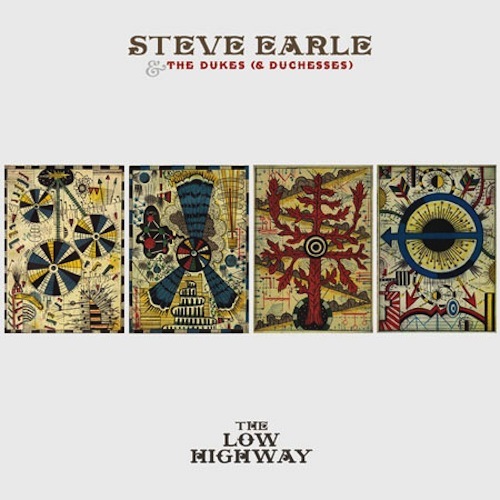 This entry was posted in 250 word album reviews and tagged 250 word album review, 3.5 Stars, After Mardi Gras, Pocket Full Of Rain, Steve Earle, The Dukes & The Dutchess, The Low Highway. Bookmark the permalink. His best in years, He has some of the best lyrics in all of Americana these days.